Looking for a new floral friend? It might be time to reconsider an orchid. Trust us – they’re lower maintenance than you might have heard. Beginning table top gardeners should consider beginning with a Phalaenopsis Orchid – pronounced fayl-eh-NOP-sis. Phals are among the easiest to care for and will reward your attentions with several months of blooms. 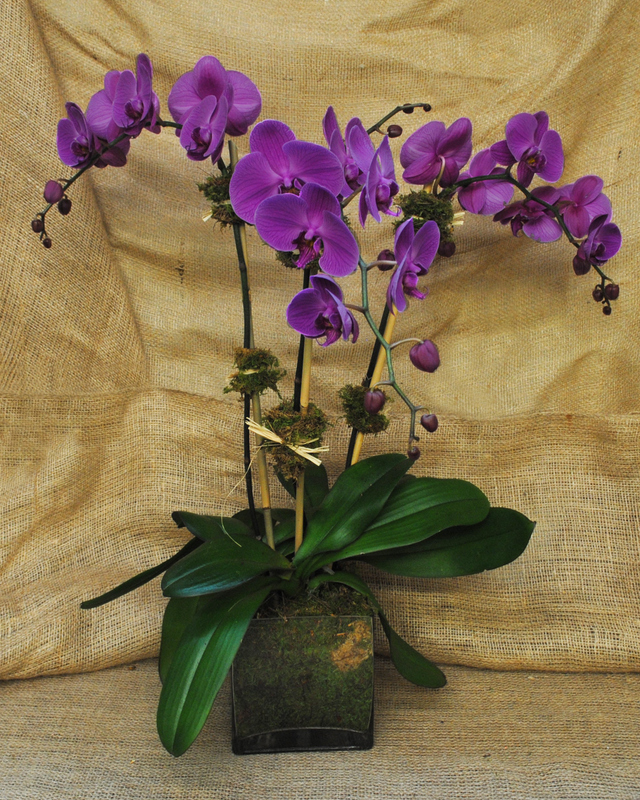 Phalaenopsis Orchids originated in the jungles of South, Southeast, and East Asia. They naturally thrive in hot climates, but under a canopy of leafy shade. 1. Phals need light, but don’t like direct sunlight. In order to keep your Phal comfy, keep it out of direct sunlight, but near a bright window. Why? Direct sunlight is like the kiss-of-death for these delicate jungle plants. When exposed to high levels of light, the succulent like leaves can burn, or even scorch. Damage to the leaves will inhibit healthy growth by messing with how the plant takes in it’s nutrients. 2. Phals like to stay warm. Phals can live in temperatures from roughly 59-86 degrees Fahrenheit. The plant generally puts out a new bloom spike in autumn and flowers through winter. If the temperature is irregular and fluctuates often (drafty windows, maybe) the plant may suffer bud drop – new blooms that fall off before opening. – A bark potting material retains less water than a moss mixture. – Heat will dry out your Phal faster than cooler temperatures. – The more light your Phal gets, the more quickly it will dry out. – Hold the fancy waters – Phals want to drink tepid tap water. – Water your orchids in the morning. – Remove any excess water that remains on the leaves or crown (where the leaves met the stem) gently with cotton balls or a tissue – pat them dry gently to avoid rot which could kill your Phal. – Drainage is really important to your orchid’s health. Standing water at the base of the plant has downright dastardly effects. Starbright Floral Design does our best to help you out by incorporating a drainage layer of river rocks into the bottom of our glass planters. It will take a minute to perfect this. In the meantime, orchids generally need to be watered about once a week in the temperate months – more if it’s hot, less if it’s cold. After a couple waterings you should have the feel of when and how much your plant needs. And the very best rule of thumb – if you aren’t sure if it’s time to water, wait a day. Orchids aren’t big eaters either. When selecting a fertilizer, go for a balanced orchid mix. Then, when feeding your orchid, dilute the recommended amount by half. Phals don’t want or need a full dose of the mix and excess fertilizer can build up as solid salts in the potting mix. Feeding your orchid a diluted solution once a week or every two weeks is ok year-round. But make sure to water your plant with clean tap water at least once a month to help break up any buildup that has been left behind. It is also ok to use a bloom booster in autumn to encourage flower growth. If you begin to see streaks of white in the fleshy leaves of your Phal, that means your floral friend is stressed out – yeah, they get stressed too. These white streaks often indicate issues with watering or light. Black blisters are a little more ominous – if you see these, reduce watering to dry the plant and isolate the affected orchid to avoid spreading the pests to any other nearby orchids. Black honey mold can also build up on the leaves. This mold is dull, black and mossy. It can be wiped off with water and a small amount of mild detergent and won’t leave lasting damage. After your Phalaenopsis has bloomed, if the leaves are strong and healthy – you can cut the stem above bottom two nodes. Nodes are the little brown lines on the stem below the bloom spike where the flowers are. This, coupled with cooler temperatures at night, will initiate and generally produce another bloom spike with flowers within eight to twelve weeks. If the leaves are not healthy, the stem down to the level of the leaves and the plant will bloom with larger flowers and a strong stem within a year. And that’s it! That’s all you need to maintain a healthy orchid plant. Don’t worry, if this sounds like a lot of work, Starbright Floral Design offers a special orchid service to help you have a healthy plant year-round.